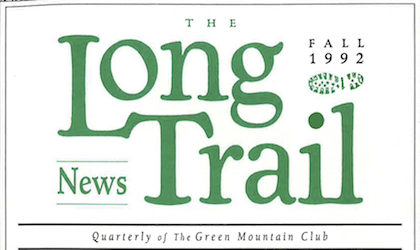 The newsletter of the Green Mountain Club first appeared in 1922 under the name The Green Mountain News. The name was changed to The Long Trail News in 1926. "The" was dropped from the name in 2006. Volume/Issue numbers first appear in the April 1929 issue, perhaps as part of applying for second class mailing permit. We are missing one issue: Volume 12, Number 4. It's been missing for some time, as noted in the November 1959 (Vol XIX No 4) issue of The Long Trail News. Copies of the newsletter were scanned into PDF on GMC's Cannon photo-copier, and manipulated with Adobe Acrobat Pro. The manipulation included optical character recognition, to enable text search within any issue; the text recognition is less than perfect. Issues of LTN since 2008 bypassed the scanner, so searching is more accurate. Use the file "Search Aid.pdx" to search the entire collection; it opens with Adobe Reader.